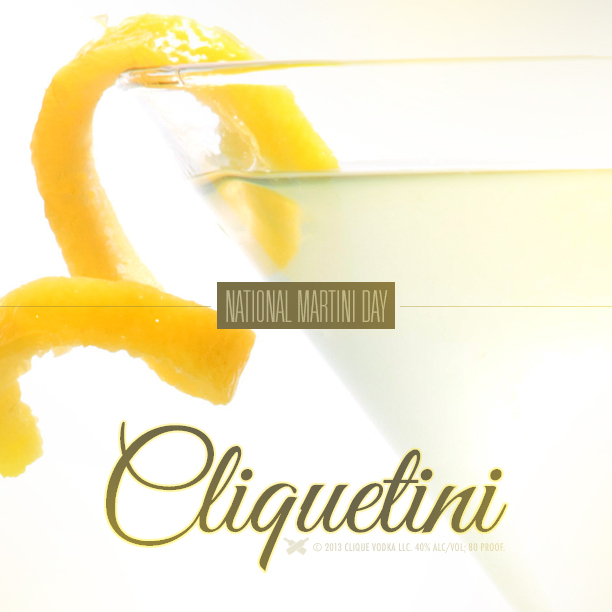 Wondering how to spend National Martini Day? 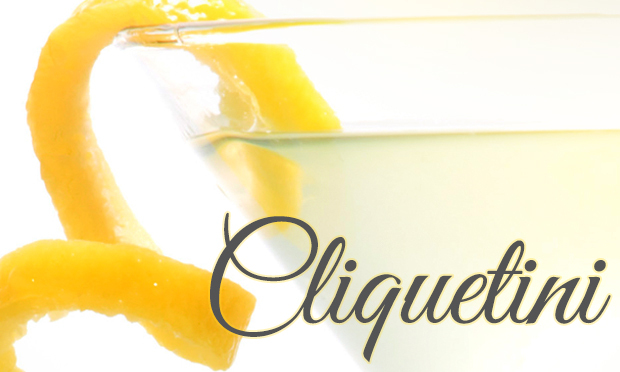 First let’s start with the ingredients: Dry Italian Vermouth, and Clique Vodka. When the martini was first invented, it used whole lot more vermouth then we are used to seeing today- but tastes have changed, and if you order a martini today you’re most likely going to get about 1/4 oz dry Italian vermouth and 2 1/2 oz Vodka, so let’s start with those proportions and add them to a cocktail tin. Add ice and stir until a frost forms on the outside of the tin- usually at least 45 seconds. Strain into a cocktail glass (that’s the proper name for the V-shaped glass martini’s come in), that has been chilled either by sticking it in the freezer for a few minutes, or by filling it with ice and water. Now you have a few choices when it comes to garnishing this delicious cocktail: You can add a twist by twisting a strip of lemon peel over top of the cocktail so the spray of oil falls in, then rub the oily skin of the lemon around the rim and place on the side. If you like olives, you can throw in a spear of them, or even add a bit of olive brine to the recipe to make a “Dirty Martini.” You can also add some cocktail onions to the drink and that would give you a “Gibson.” And if you don’t like vermouth in your cocktail you can always skip it- that would be a straight up martini, or just swirl a bit around the inside of the glass and toss it out before straining the martini in- that would be called an “In & Out.” If you prefer any of these over ice you can make them “On the Rocks,” or you can always shake the cocktail if you prefer, although some don’t like the air bubbles and clout that this causes and call it “bruising the cocktail.” Whichever method or combination of techniques you try, finding your perfect martini is just the way to spend National Martini Day!